COROLLARY THEOREMS: "First is the will; knowledge and skills come later." These Design Notes have been added to guide, a little bit, designing efforts of our readers. 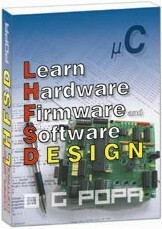 The topics presented here are related to a few hardware design aspects mentioned in the first part, Hardware Design, of our book, LEARN HARDWARE FIRMWARE AND SOFTWARE DESIGN. » LINK TO "LOGICALLY STRUCTURED ENGLISH GRAMMAR"